The WER 2016 Annual Forecast Report (1) presents a detailed analysis of the future business environment likely to prevail in the global deepwater sector through 2020 and (2) provides our forecast of floating production system orders to be placed over the next five years. The forecast is segmented into eight types of production units -- FPSOs, Production Semis, TLPs, Spars, Barges, FLNGs, FSRUs and FSOs – and we project the number of units to be ordered, composition of the orders and Capex to be generated. A realistic, bottom-up forecasting methodology is employed, using projects in the planning stage and our assessment of underlying business conditions as the basis for projecting equipment orders over the 2016/20 time frame. 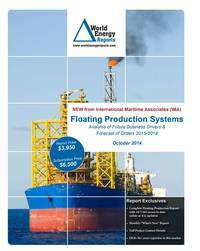 This is IMA’s 19th annual forecast of floating production system orders since IMA began the floater forecasts in 1996. In the data section of the report are details for 247 floater projects in the planning stage, 69 production or storage floaters now on order, 279 floating production units currently in service and 23 production floaters available for redeployment contracts. Charts depict the location where floating production and storage systems are being planned, operating and being built.